I'm only going to deal with one kind of flicker, the one that was bugging me! The screen would flicker in such a way that I could see what was previously on the screen. For instance, in the middle of battle, I could still see the battle-loading screen flickering on the battle-screen. And moving my gun target left a trail of target cursors in its wake. Don't even think about what happened when I rotated my point of view. Suffice to say it was unplayable. This is the view mid-game! It turns out that WoWs doesn't respect the hardware anti-aliasing setting on your graphics chip, and tries to do it for itself. That means that if your graphics processor is set to do the anti-aliasing itself, you're in trouble, and you need to switch off the hardware anti-aliasing. But only for WoWs, or you risk other 3D software slowing down. 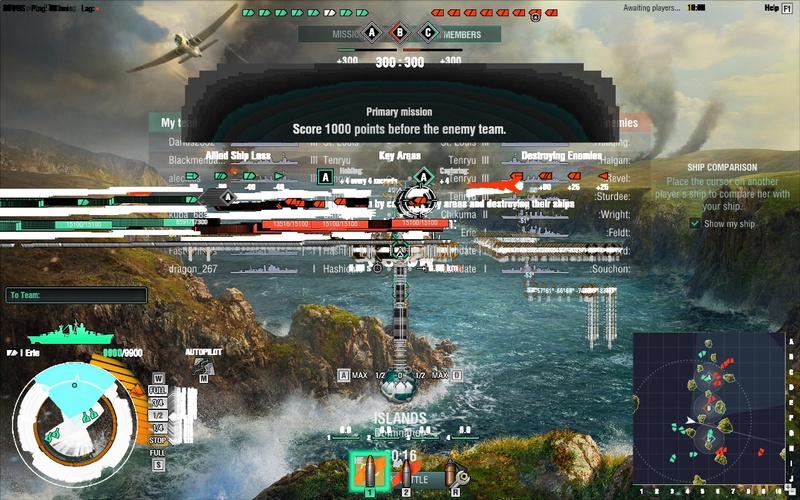 I don't care about that, so I put up with it to get WoWs running. I've got a very basic graphics chipset, an AMD Radeon HD 5450 (I know this because it comes with some management software that told me (AMD Catalyst Control Centre (or CCC ))). To fix the problem, I went into CCC, selected "Gaming"->"3D Applications", and then changed the setting "Anti-Aliasing Mode" from "Override Application Settings" (which I presume is the default) to "Use Application Settings". Once I'd done that, the game played perfectly. Then I decided to take some screen shots, like the one above, so I set the Anti-Aliasing Mode back to "Override Application Settings", and tried again. Lo and Behold, there was no flicker! What happened? This: when I set the Anti-Aliasing Mode to "Use Application Settings", CCC automatically changed the next setting, "Anti-Aliasing Samples", to "Use Application Settings", also. Then when I changed the Anti-Aliasing Mode to "Override Application Settings" for the screenshots, it automatically changed the "Anti-Aliasing Samples" to "None". I don't know what its original factory setting had it at, but when I changed it from "None" to "2x", the problem came back. 2. Change the Anti-Aliasing Samples to "None". What about those predictions, then? Ahoy there, me hearties! Avast behind!